Unrest in the Roman Empire 1,700 years ago is the most likely explanation for a hoard of 30,000 coins found by archaeologists working at the site of a new city centre hotel in Bath, home of the famous Roman spa and baths (click here for our review). 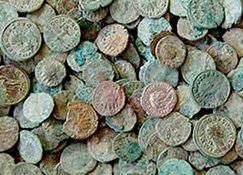 The ‘Beau Street Hoard’ is the largest stash of Roman silver ever discovered in the UK. The coins have fused together into a single block of metal making it difficult for the London Museum in charge to count and identify the loot. By weight it is worth around $250,000. After all until you know the intrinsic value of any asset it is difficult to appreciate it. The same happened with crypto currencies. Now that people know how profitable it can be to invest in cryptocurrencies they either trade independently or with the help of bots like Bitcoin Loophole to make quick profits. We can only speculate what its value was in Roman times. At the time there was a great deal of inflation in the empire as a result of monetary devaluation with the silver content of money reduced. And they say history does not repeat itself! But we thought the discovery of this stash of silver also highlighted a big flaw in the argument for hoarding physical silver in secret locations. This is what many precious metal bugs do. They buy gold and silver and shove it up a drainpipe or bury it in the garden. That is what the owner of the 1,700 year old hoard was most likely doing. What became of the owner? A sudden blow to the back of the head? A heart attack? OK so perhaps it did not matter to him that his fortune was lost for nearly two millennia but maybe he had dependents that should have benefited. The ArabianMoney investment newsletter has a number of much better alternative ideas for investment in silver with ultra-low third party risk and no risk of confiscation by such natural causes (subscribe here). Leaving some kind of a paper trail to your wealth usually makes sense. Otherwise there is the danger of losing it altogether. We wonder how many silver stashes will be discovered in the UAE in 1,700 years time, abandoned by some expatriate who came to a sticky end in a car crash! Perhaps those nice 1kg bars that are still quite affordable. We certainly know of individuals all over the world with their precious metals hidden in a safe place. It’s not really a good idea unless you what to make some archaelogist a happy man or woman in the very distant future! For the truly paranoid should realize they are a risk to themselves.